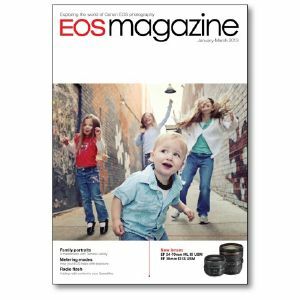 Add this issue to your EOS library with technique articles on family portraits, how your EOS helps with exposure and adding radio control to your Speedlites. World of EOS Farewell to 5D Mark II. Firmware updates for the EOS-1D X and 6D. Kos Evans sails off on more EOS adventures. Plus spectacular and awe-inspiring competition winners including Wildlife Photographer of the Year 2012. New Canon equipment Two new lenses EF24-70mm f4L IS USM and EF 35mm f2 IS USM. Metering modes Perfect exposure is the holy grail photography. Masterclass Your approach is as important as your kit when photographing children, advises Tamara Lackey. Digital zoom Cropping can get you closer if you don't have a super-zoom, but at what impact to photo quality? Radio flash Canon's Speedlite 600EX-RT and other units that offer radio communication for flash photography. Northern lights David Clapp photographs the northern lights with stunning results even at high ISO. How it was shot Andy Fox experiments with speakers and paint. Focus tuning How to sharpen up your images with moire screen and AF microadjustment. Select and sort Exploring the cataloguing features of Canon's DPP software. Flying success Neil Hutchinson tests the image quality and autofocusing accuracy of the EOS-1D X. Protect and recover How to recover and protect your images files.